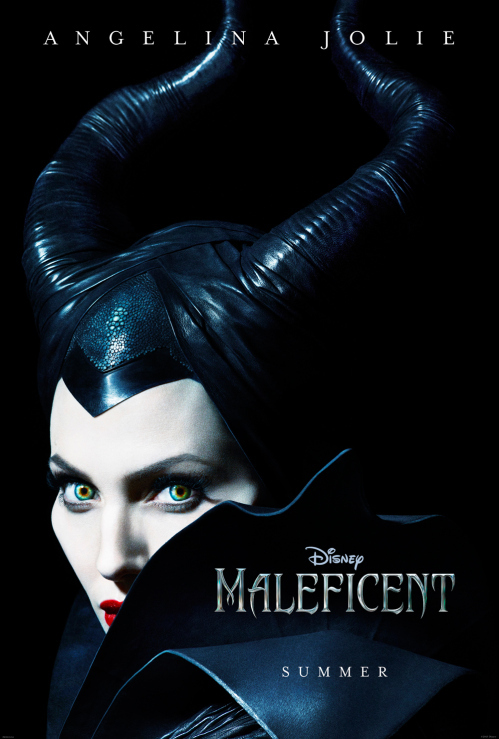 Disney Unveils New ‘Maleficent’ Trailer and Poster Featuring Angelina Jolie!!! Maleficent is by far one of the most wicked of all Disney villains. She appears at will, places curses on babies and that’s all before she turns into a bloody behemoth of a dragon! I just saw the new poster Disney released for “Maleficent“. This is the big movie we’ve heard of for so long that Angelina Jolie was supposed to be just perfect for. On the poster with her look, it’s clear they went straight by the animated film for a basis. That’s ok, the animated version was pretty wicked looking. I’m more concerned about her acting, or over acting of the character. The animated Maleficent had that cool, easy air about her. Like she knew she could snap her fingers and bring the castle to ruins. I’m not sure Jolie can pull that off. It needs to be a dry wickedness, whereas Jolie’s, much like her lips, will probably be more full. I’m ready to see the trailer when it drops tomorrow. I remember having the same excited hopefulness when I first learned of Snow White and the Huntsman. Charlize Theron just gave a so-so performance and that’s why I’m skittish about whether or not Jolie can fulfill another one of my childhood favorites. Plus, I’m not a huge fan of Jolie, either. The cast includes Sharlto Copley, Elle Fanning, Sam Riley, Imelda Staunton, Juno Temple and Lesley Manville. This Sleeping Beauty re-hash will hit theaters on May 30, 2014. Disney-Pixar Gives Us Our First Peek At ‘The Incredibles 2’!!!! ‘The Beguiled’ Comes To Home Video In October!!! This entry was posted on Wednesday, November 13th, 2013 at 12:47 am	and is filed under Film. You can follow any responses to this entry through the RSS 2.0 feed. You can skip to the end and leave a response. Pinging is currently not allowed. « ‘The Walking Dead’ Season 4 Recap – Episode 5 ‘Internment’! !